Thermocouples | Thermowells | Temperature Sensor - Chase Controls, Inc.
Chase Controls is a stocking distributer for Blue Ribbon bi-metal thermometers and thermowells. Reotemp is our supplier of both thermocouples and RTD’s. Blue Ribbons bi-metal thermometers are offered in either 3” or 5” dials. The 5” bi-metal is offered in various configurations including back mount, lower mount or every angle design. Stem lengths range from 2 ½” to 12”. 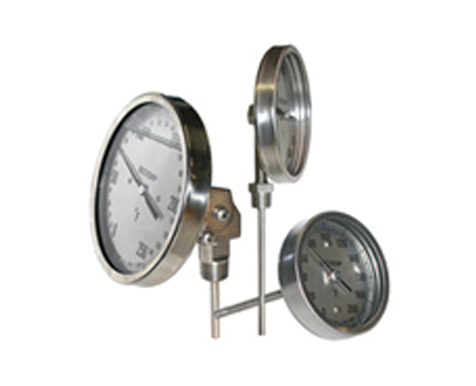 Thermowells are typically 316SS and are manufactured to match the thermometer stem lengths and are either stepped shank or straight shank. Reotemp manufactures a variety of thermocouples and RTD’s depending on the applications. Thermocouples consist of two wire legs made from different materials. These wire legs are welded together at one end, creating a junction. This junction is where the temperature is measured. When the junction experiences a change in temperature, a voltage is created. The voltage can then be interpreted using thermocouple reference tables to calculate the temperature.